Country Heritage Homes is now a division of Linwood Homes Ltd. The Anchorage is a stunning new Architectural Series home package – developed, designed and supplied by Linwood Custom Homes. The Heron - Build it in the Caribbean or in North America. This home package is an incredibly flexible home design. The Birchview is an example of one of the best, small, post and beam home packages on the market. 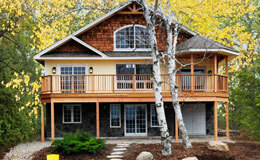 Linwood Custom Homes offers you the most efficient and cost-effective solution for new home building. We help you build a new custom home using award-winning house plans and premium home package materials. With three different house specifications Linwood has a dream home for any budget. Country Heritage Homes sells prefab homes & prefab houses plan packages (i.e., kits) through the US, Canada (Canadian) and overseas. Country Heritage Homes was founded in 1967 and quickly established itself as a successful designer and builder of custom prefabricated homes. Our current line of prefab homes and prefab houses represents the very latest in design and build technology. We specialize in prefabricated homes and prefabricated houses with vaulted ceilings and the use of natural light. State of the art computer equipment is used to design special homes with modern floor plans, exciting interior features and striking exterior looks. The company has developed and applied innovative new technology in the form of our proprietary Opti-Bild design system that optimizes the use of materials in the construction of the home. It has also created the system to source the best performance products available in the market suitable for inclusion in each individual home package. You can rely on an organization that has designed and built thousands of homes for satisfied buyers all over the world. Our 35 years of experience has been essential in allowing us to develop the right construction specifications backed up by the know how of being able to produce an exceptional home using a proven system at a highly competitive price. 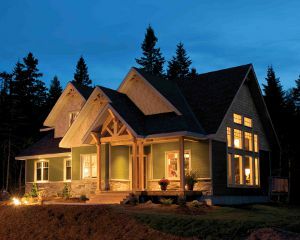 The Country Heritage Homes line of homes is available in a wide variety of highly appealing designs. 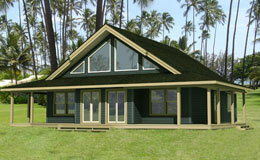 All home packages are complete with full construction blueprints and are pre-engineered for structural integrity. The designs can be modified to meet your individual needs. This one-stop service is available at a surprisingly affordable price. Experience for yourself the benefits of dealing with the industry leader. Simply contact us to talk to a knowledgeable consultant who can start to turn your dream into reality today. Note: We ship our houses throughout the U.S. and Canada in such places California, Colorado, Michigan, Washington, Ontario, Phoenix, Arizona, Utah, etc.